7 (x = 0.5, n = 2). The name is also used for any salt of such anions, such as sodium metasilicate; or any ester containing the corresponding chemical group, such as tetramethyl orthosilicate. 2 (silica, quartz), which would correspond to x = 2 in the general formula. The term also includes minerals where aluminum or other tetravalent atoms replace some of the silicon atoms, as in the aluminosilicates. Such silicates comprise most of Earth's crust and mantle, as well as the other terrestrial planets, rocky moons, and asteroids. Silicates are extremely important materials, both natural (such as granite, gravel, and garnet) and artificial (such as Portland cement, ceramics, glass, and waterglass), for all sorts of technological and artistic activities. In most commonly encountered silicates, including almost all silicate minerals found in the Earth's crust, each silicon atom occupies the center of an idealized [tetrahedron] whose corners are four oxygen atoms, connected to it by single covalent bonds according to the octet rule. 18. Polymeric silicate anions of arbitrarily large sizes can have chain, double chain, sheet, or three-dimensional structures. Typically, each oxygen atom that does not contribute a negative charge to the anion is a bridge between two silicon atoms. The structure of such anions is commonly described and depicted as consisting of silicon-centered tetrahedra connected by their vertices, in such a way that each vertex is shared by at most two tetrahedra. 6 that occurs in thaumasite, a mineral found rarely in nature but sometimes observed among other calcium silicate hydrates artificially formed in cement and concrete submitted to a severe sulfate attack. At very high pressure, even SiO2 adopts the six-coordinated octahedral geometry in the mineral stishovite, a dense polymorph of silica found in the lower mantle of the Earth and also formed by shock during meteorite impacts. Solid silicates are generally stable and well characterized. Silicates with alkali cations and small or chain-like anions, such as sodium ortho- and metasilicate, are fairly soluble in water. They form several solid hydrates when crystallized from solution. Soluble sodium silicates and mixtures thereof, known as waterglass are in fact important industrial and household chemicals. Silicates of non-alkali cations, or with sheet and tridimensional polymeric anions, generally have negligible solubility in water at normal conditions. The equilibrium can shifted towards larger anions by increasing the silicate concentration and/or the acidity of the medium. 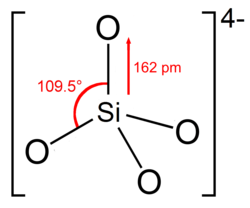 The orthosilicate anion, for example, is assumed to be the predominant form of silica naturally dissolved in seawater, whose concentration is below 100 parts per million; and also when silica is dissolved in an excess of sodium oxide at pH 12 or more. In higher concentrations or low pH, polymeric anions predominate. In the limit, the silicate anions merge into a tridimensional network of silicon tetrahedra, with most oxygen atoms occurring as covalent bridges; which is some form of silica, such as silica gel, mixed with water. Silicate anions in solution react with molybdate anions yielding yellow silicomolybdate complexes. In a typical preparation, monomeric orthosilicate was found to react completely in 75 seconds; dimeric pyrosilicate in 10 minutes; and higher oligomers in considerably longer time. In particular, the reaction is not observed with suspensions of colloidal silica. The nature of soluble silicates is relevant to understanding biomineralization and the synthesis of aluminosilicates, such as the industrially important catalysts called zeolites. ^ a b c Knight, Christopher T. G.; Balec, Raymond J.; Kinrade, Stephen D. (2007). "The Structure of Silicate Anions in Aqueous Alkaline Solutions". Angewandte Chemie International Edition. 46: 8148–8152. doi:10.1002/anie.200702986.